Production music libraries are a major source of songs and underscore for film and TV productions, multi-media projects, video games, commercials, music between TV and radio programs and commercials, station ID’s, station and show promo’s, direct to DVD/video productions and many other uses where producers need quick access to pre-cleared (the rights already granted), inexpensive music. There’s been an explosion of production music libraries in the past few years that parallels the growth of new digital cable channels, satellite and web radio broadcasts. If you’re an unknown writer or band who doesn’t have the clout to get your songs into big budget productions and don’t have the time to constantly research all the new low-budget shows that may be in production and in need of underscore music or songs, music libraries represent a major opportunity for you. These companies secure the rights (more about that later) to broadcast quality songs and instrumental underscore compositions submitted to them that they feel they can place in audio-visual productions. They then assemble and reproduce “libraries” of these collections on CD’s (and/or online) and make them available to production companies. Some of the bigger libraries hire their own in-house composers to create music for them but will also sign individual songs and complete new libraries from indie composers. That’s where you have your best opportunity. What does “broadcast quality” really mean? Don’t feel you have to spend a bundle on studio masters. Any good digital audio work-station (DAW) setup or a good live recording can give you the quality you need if you know what you’re doing. Apple’s Garage Band continues to upgrade to take even more advantage of the new screamin’ Intel Core Duo processor. The trick is to study and experiment with it (or any other software or operating system you use) to maximize the quality of your recordings. Recording, The Magazine For The Recording Musician is a great resource. If you’re submitting instrumental pieces, they should be well arranged. Stay away from using stock sounds that come packaged with your keyboard or software. Use live musicians whenever possible, particularly for rock and country. They hate keyboard triggered samples that emulate steel or acoustic guitars, saxes, etc. Try to create fresh sounds. Generating a mood is important. They’ll use pieces with strong melodic themes but will also use underscoring that just enhances a mood. It’s also a good idea to produce mixes with and without lead instruments. Songs are used in many different ways. Sometimes the lyric is important. Sometimes it’s irrelevant, and your song will be barely audible in a bar scene behind a conversation. It may be more important that the style is authentic and appropriate for the era in which the story is set. Exercise: Tape TV shows (Try a drama and a comedy.) with just an audio recorder. Play them back and make lists of all the “cues” (pieces of music used) with info about mood, number of instruments, style, length, use of songs vs. underscore, and how many are under the dialog. Are they using different mixes of the same track for different cues? There are actually cases of entire shows being scored using a single five-minute piece of music that’s dissected and used in different configurations for each cue: only drums and bass in one, just the string pad of part of the piece in another, etc. Use this information as a guide to the cues you’ll submit as demos. The best resource I can give you is to go to a series of interviews with music supervisors and music editors along with other very valuable information by Skip Adams. Skip is a music publisher whose company, Global Graffiti specializes in custom placement for film and TV. I particularly liked his interview with Madonna Wade-Reed whose music supervision credits include Boston Public, Alias, and Smallville. I especially like her candor in describing what she does. Advances are rare. They know that you know you’ll make most of your income on the “back end” from your PROs after it’s broadcast. In most of the situations listed above you’d get an advance for synch and master use licenses when pitching directly to music supervisors for specific shows or a percentage of the advance when pitching via song placement companies. That’s not the case with music libraries. Contracts vary from library to library so read them very carefully. Some are actually publishing agreements in which they own the copyright just like any other publishing contract. You get your 50% writers share. I’ve also seen exclusive publishing deals in which the library exempts a maximum amount of CD sales 5,000 or 10,000 for example (This is undoubtedly negotiable.) that the group is allowed to sell without the publisher taking publishing royalties. Ideally you’d want a non-exclusive deal in which you’re free to use the song in your own CD and sell as many as you want – or place it in film TV on your own. A trade-out on that situation is that they’ll often want not only the publisher’s share of income but 50% of the writer’s share (This usually happens when the library is required to give the publishing rights to a film company to get the placement..) leaving you with 25%. Though splitting the writer’s share goes against everything holy to me, you have to decide how important it is to you to have a non-exclusive contract. You need to consider that carefully, especially if you have a co-writer, which means that you’d now be looking at 12.5 %. Speaking of co-writers, it’s important that you have a written agreement that neither of you can make any kind of deal other than a compulsory license (See page___) without the other’s consent. That would certainly include the above situation. Reversion clauses can sometimes be negotiated that give you back the rights to the song within two or three years if it hasn’t been placed. For the master recording, a license must be granted to the audio-visual producer that states that you control all the rights to the performances on the recording. Each musician or singer who contributes a performance to your recording has a copyright interest in their performance and you must cover yourself with a “work for hire” release agreement with your musicians/singer(s), (See Work For Hire Agreement) Though you may not have to show these releases to the production music library or the audio-visual producer, you’ll have to “warrant” in the contract that you have done it so your singer doesn’t sue them when she hears herself on that TV show. If you pay your musicians and singers for the sessions and get the releases, you have no obligation to pay them more later and it’s cleaner that way. However, a situation in which you might consider it would be if you have a band or a dedicated group of musicians/singers you work well with and can always count on to give you great performances. Sometimes it’s tough to find a crew like that and you want to keep them happy by sharing a percentage of the “master use” half of the income. As an indie self-published writer you – and co-writer(s) get the “synch” portion. A caution in making the decision to give your musicians a piece of the action is that it could compromise or preclude your ability to make a deal with the publisher or song placer later, with whom you would need to share all or part of the master-use fee. Note: If you hire a demo service to produce your demos, do not forget to have them sign a work-for-hire agreement. Before you even commit to hiring them be sure to let them know that you require it. Most demo-services today do broadcast-quality work that will easily qualify for broadcast use and they don’t mind giving you a release agreement. A common practice for music libraries is to limit their involvement only to audiovisual uses. The benefit for the writers is that they’re free to use the songs on their own CDs, for example, without having to pay royalties to the music library for a song they played no role in exploiting. The benefit to the library is that they’re able to offer a non-exclusive license to the writer and it gives them competitive access to better material from bands who wouldn’t go for an exclusive contract. Actually, re-titling as been working pretty well so far despite the fact that, according to some attorneys and publishers, this is problematic because the rights given to the music library are actually for the same song since nothing is really changed but the title. Music business attorney Andrea Brauer has much experience with these deals and offers this advice about some things to watch for in the contracts. “The practice these days with music libraries is to acquire the rights for a “derivative work” of the original song, thereby allowing the songwriter to retain ownership of the composition and at the same time allowing the music library to license and thereafter collect its proper income on placements of the composition. Of course to create this derivative work, the library simply takes the original work, as is, and re-names it. Unfortunately, this re-titling of songs clashes head on with copyright law which will not recognize the existence of a separate work unless the new work has been fundamentally changed in terms of its lyrics or melody. Nevertheless, music libraries are not likely to change their practice until confronted by the copyright office, so here’s some advice about what should be contained in those contracts. First of all, the whole point from the songwriter’s perspective is to protect his/her rights in the original song. Therefore, the contract must specifically acknowledge the existence of the original song and its title; it must acknowledge that the rights being granted are for a derivative of the original song and it must state the proposed new title of the “derivative work”. There must be a clause reserving all rights in the original song to the songwriter and a clause stating that the music library has no rights to the original song. This may all seem self evident but you’d be surprised at how many poorly written contracts fail to mention any titles at all and, as a consequence, the library gets credited with the wrong title. Caution: A practical problem with re-titling is that many music supervisors at audio/visual production companies do NOT like it. Here’s what happens: The music library pitches the song for a TV show, then the writer/artist/band happens be be heard by, or has a contact with, that same music supervisor at the show who hears the same song with two different titles, from two different sources. A big red LEGAL TROUBLE!!! sign flashes through her mind and she says no to both. And in series TV there’s no time to sort it out. Music libraries offer a great opportunity for writers of both songs and instrumental tracks to potentially earn a substantial income from the use of their music in film, television, games and a variety of other audio-visual uses. It does take time, dedication and patience because you need to grow it song by song and placement by placement. Nothing happens overnight. To find music libraries, get Music Business Registry‘s Film and Television Music Guide. Websites with lists of production music libraries. … or just search Google under “Production Music Libraries”. 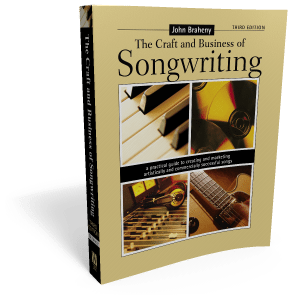 A version of this article appears in The Craft and Business of Songwriting (3rd ed) by John Braheny.